BANGKOK: The diplomatic rift in the Middle East has wreaked havoc with airlines in the region, with major long-haul carriers such as Doha-based Qatar Airways, Bahrain’s Gulf Air, Abu Dhabi’s Etihad and Dubai’s Emirates suspending flights, leaving many passengers stranded at airports in the Gulf. Arab countries, including Saudi Arabia, Bahrain, Egypt, Yemen and the UAE have severed ties with Qatar over what they say is Qatar’s support for terrorism. Saudi have closed their airspace. The escalation is having a devastating effect on travel throughout the region. John Strickland, a UK-based aviation consultant, in a recent interview said the announcement “came as quite a shock” to the industry. 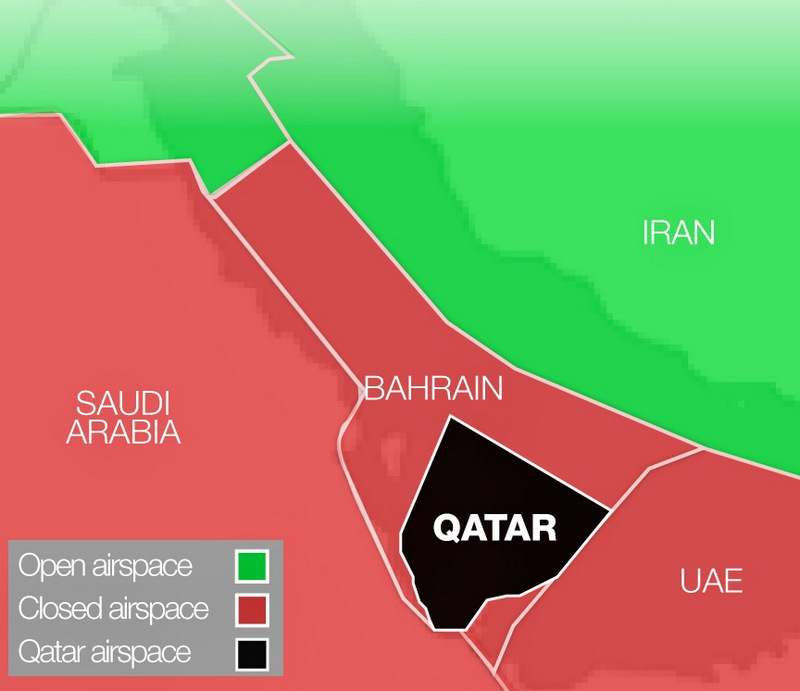 He added that there are two main air routes in and out of Qatar – over Saudi Arabia and Bahrain with the latter controlling most of the Gulf air space. If Qatar is banned, I can’t see a way out of the country for Qatari aircraft,” he added. Saj Ahmad, an analyst with London-Based Strategic Aero Research, told Khaleej Times that the “damage here isn't a one-way street”. He said that airlines “like Emirates, FlyDubai and Etihad out of Abu Dhabi will end up reeling from the sudden collapse of traffic rights”. The impact on Thailand – and specifically Phuket – could be significant because Qatar Airways has a large aircraft capacity between Thailand and Qatar, industry executives who are familiar with the airline told the Bangkok Post. Qatar Airways operates five daily non-stop flights between Doha and Bangkok, double-daily Doha-Phuket flights and four Doha-Krabi flights a week. It has also set sights on the debut of the first Doha-Chiang Mai non-stop from Oct 31, with four flights a week. Speaking to the Bangkok Post on the sidelines of the International Air Transport Association (IATA) World Airport Summit in Mexico on Tuesday, Bangkok Airways president Puttipong Prasarttong-Osoth said it was too early to assess the impact on Thailand with the development still unfolding. How did the dispute start and what is it about? Simply put, Qatar’s state media published statements attributed to its Amir Sheikh Tamim bin Hamad Al Thani which criticised the policy towards Iran maintained by the Gulf Cooperation Council (GCC), a political and economic alliance of six Middle Eastern countries – Saudi Arabia, Kuwait, the UAE, Qatar, Bahrain and Oman. Saudi Arabia, Egypt, the UAE and Bahrain then cut their ties with Qatar as the dispute escalated, opening up the worst rift in years among Arab states. The other states say Qatar is supporting the Muslim Brotherhood and extremist groups and possibly Iran. The three Gulf states gave Qatari visitors and residents two weeks to leave their countries. Qatar has also been expelled from the Saudi-led coalition fighting in Yemen. Saudi Arabia has blocked its airspace to flights to or from Qatar. Qatar owns the influential state-owned satellite broadcasting channel Al Jazeera, which generally enjoys a good reputation, but Saudi Arabia accuses Qatar of backing militant groups and broadcasting their ideology via Al Jazeera. Bahrain has also attacked what it calls Qatar’s “media incitement, support for armed terrorist activities and funding linked to Iranian groups to carry out sabotage and spreading chaos in Bahrain”. Qatar however is getting support from long-time friend Turkey. In the latest development, Turkey has stepped in to back its ally Qatar. Turkey’s parliament this week passed a law to allow Turkish troops to be stationed on Qatari soil and troops will soon be sent there. 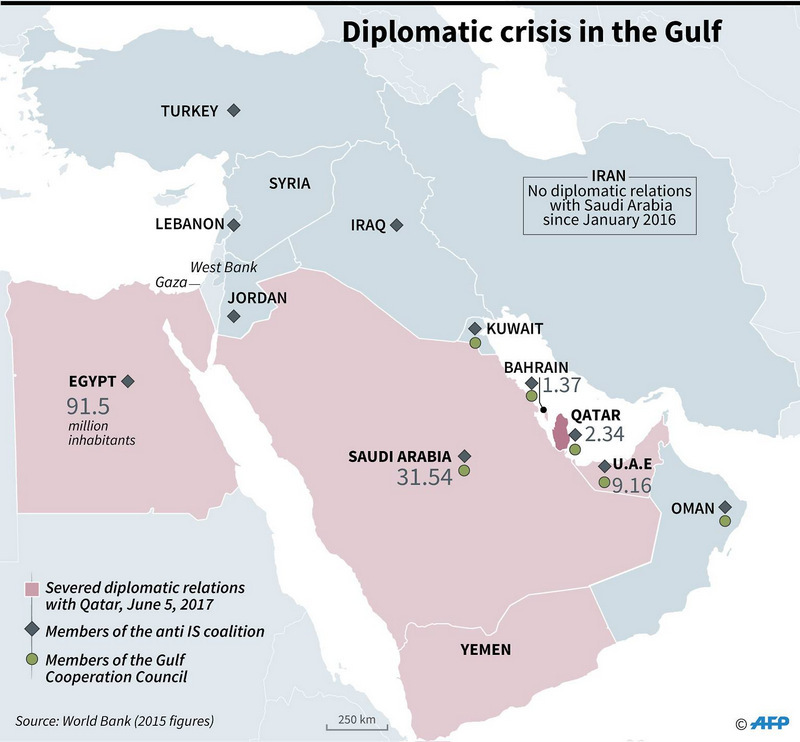 And the diplomatic crisis has wider implications. Qantas for instance has said Qatari nationals will be banned from boarding Qantas flights via Dubai because the United Arab Emirates (UAE) has banned them from passing through its airports. The Australian airline, which has a commercial alliance with Dubai-based Emirates, is banning citizens of tiny Qatar from its flights via Dubai until further notice. “Major airlines based in the UAE have announced that flights between the UAE and Qatar will be suspended from 6 June 2017 until further notice, while Egypt has closed its airspace to Qatari aircraft. Qatar Airways flights to and from Saudi Arabia and Bahrain may also be affected. If you have an upcoming flight to, from or transiting Doha, contact your airline or travel provider for further information. We understand that Qatar Airways flights to and from Australia will continue to operate. " This is a serious blow to Qatar Airways which has one of the youngest fleets in the sky and has been growing at a rapid pace. Aircraft manufacturers are naturally nervous about financial fallout from the dispute, with billions of dollars of orders potentially at risk. 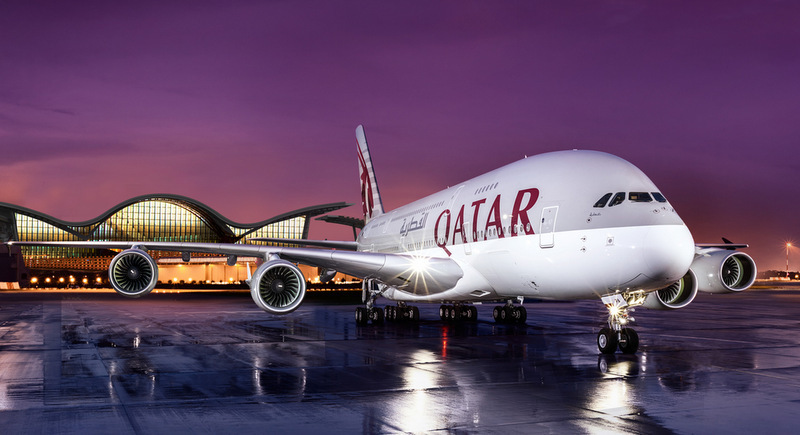 Qatar has hundreds of new aircraft on order including 60 A350s; 30 B787 Dreamliners, 46 A320s, four A380s and 60 B777s. Qatar have been on the cutting edge when it comes to ordering new planes and were the first airline to operate the A350. Andrew J Wood has over 35 years of hospitality and travel experience. A long-time resident of Thailand, he is a former hotel general manager and Immediate Past President of Skal International Thailand. Mr Wood is also a Director of Worldwide Destinations Asia Co Ltd in Bangkok and a regular guest lecturer at various Universities in Thailand including Assumption University’s Hospitality School. Worldwide international protests starting up, countries, airlines, and multinationals are very unhappy with the ban on Qatar ( read: they loose money and business). Money speaks much in 'politics'. Think for example just about loosing the hundreds aircraft-order by Qatar in USA! Trump is already jumping.., saying that Qatar shows already her 'good will'. Bernie...Consult your Travel Insurance Policy, then the Airlines. Bernie,better you contact Qatar-Airways!Dont listen to Kurt,it could ruin your holidays. Bernie:  October is still some time away. I would say, wait and see a while. Stands can soften coming time. Qatar already declared that it will continue to deliver gas to the other countries around her. Kuwait likes to mediate, etc. Will Qatar be refunding tickets already booked and paid for??? We are booked and paid to fly to Phuket in October 2017....What Now!! !